Lacquer is a material used to give bowls, trays, lunch boxes, sushi boxes, and more a high gloss and sleek finish. Not only is it durable, light, and easy-to-clean, it can be used for a variety of different items and comes in many different shapes and styles, such as the characteristic boat design featured in this collection. 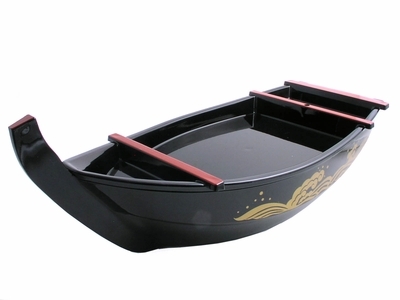 Because of the high cost of lacquerware, our boat trays are made of sturdy plastic and finished with lacquer for affordable quality our customers can appreciate.